You are here: Home / Inspiration / Take Inspired Action / Why Time Management Doesn’t Work – Are You Getting In The Way Of Your Productivity? Why Time Management Doesn’t Work – Are You Getting In The Way Of Your Productivity? People often ask me how I get so much done. I’m not a genius – I’m just like you – but I know that traditional ‘time management’ doesn’t work any more. It’s twenty years since I taught my first time management course, in my first engineering job, and I now realise it was all back to front. I recently did an interview with Sanebox.com as part of their Productivity Giants series and we talked about how classic time management techniques can fall apart. In fact, my 15+ years of mentoring entrepreneurs and passionate world changers have shown they can actually make things worse. Have you been ‘getting in your own way’ with overwhelm, distractions and procrastination? Where were you on the 0-100 commitment scale? How does that change, when you uncover the secondary gain that had been keeping you stuck? What actions might you take, in the next 24 hours, to turn that around? Make sure you have taken my 5-day Ditching Overwhelm Challenge. 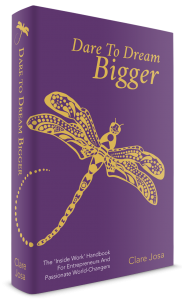 Plus you’ll find inspirational how-to for secondary gain, ditching self-sabotage, cranking up your commitment and taking the inspired actions that lead to breakthroughs, not burnout, in Dare to Dream Bigger: get your copy of Dare to Dream Bigger here. And if a secret dose of Imposter Syndrome is what’s keeping you stuck at the lower end of the commitment scale, make sure you join me for this live masterclass to get you ditching Imposter Syndrome, once and for all: Imposter Syndrome Masterclass.